At MCDS, art and music are not just special subjects, but valued components of our comprehensive curriculum that inspire critical and creative thinking from our students. As students move from art to science, then music to math in the course of the same day, they make important connections from the interaction of different perspectives of knowledge and the world. 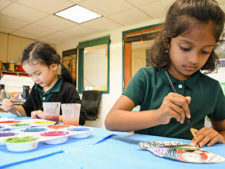 Visual Arts: Students begin in Lower School with a drawing-based curriculum, as well as learning art history from around the world. Students learn five basic elements of shape as they develop a wide range of techniques and work with many mediums including clay. As students progress into middle school and high school, creative expression and problem-solving become more sophisticated. 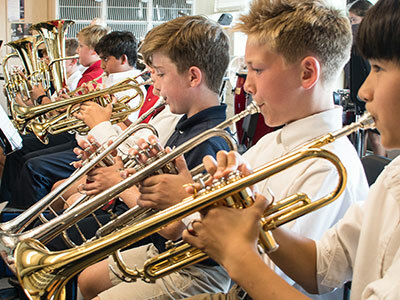 Music: Students begin in Lower School with choir, general music and music theory. Semi-private piano lessons start in the First Grade with the option to add a string instrument in Third Grade. From piano lessons to jazz ensemble and orchestral ensemble, our students experience the joy of learning an instrument and applying all of the knowledge they learn in music theory classes. MCDS is a proud member of the Wisconsin School Music Association. 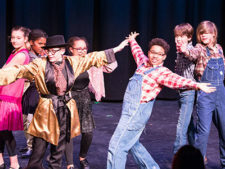 Theater: Students enjoy extensive opportunities to explore their passion for the performing arts. A no-cut policy underlies our approach to the musicals and plays which are performed every spring and fall in our gymnasium/theater facility. Musical performances occur throughout the year, both during the school day and at special evening performances.